Cut from the same lean cloth as the Speed binding, the TLT SpeedFit also offers hassle-free performance in a lightweight package. The Speed Fit is built with heavier steel toe-wings and slightly lower release values, but otherwise is the same binding at a lower price. But alas, the SpeedFit is equipped with BSL adjustment, lateral release adjustment, and multiple risers. 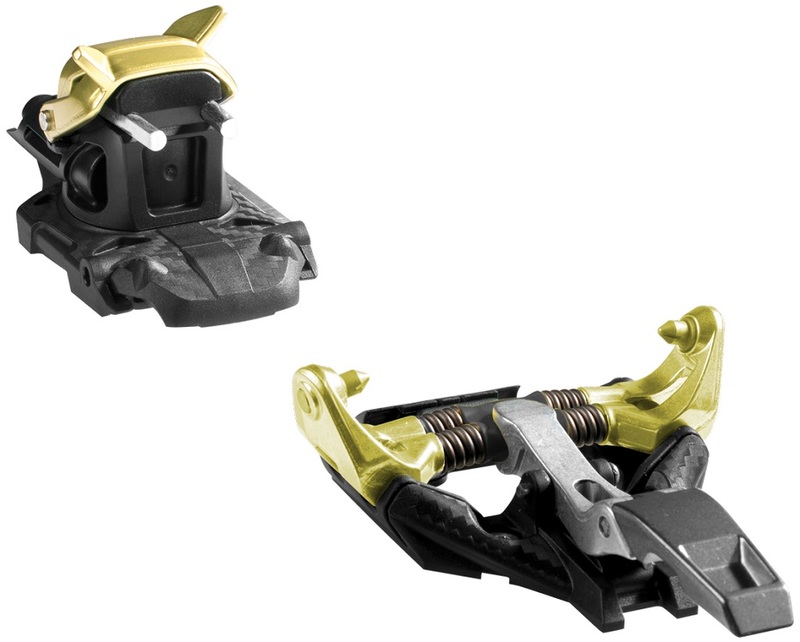 The heel piece spins 180° to access the nearly-flat mode, then one or both risers can be flipped down to adapt to the skin track. An optional brake is available with a variety of sizes to suit everyone's fancy. The Dynafit SpeedFit pairs nicely with your choice of touring ski and cold-smoke. Ice-Breaker pins help clear debris from you boot fittings. +/-5mm adjustment in the heel track for different boots. Two riser-heights and a nearly-flat mode to choose from. Adjustable 5-10 lateral release and fixed vertical release. Optional 75mm, 90mm, and 105mm brake sizes, sold separately. Bayonet lock means it’s more easily-serviced than others. Update 2018/19: The binding now comes with an aluminum toe piece (instead of steel) and new anodizing, offering a very noticeable 55g of weight savings per side. How easy are the heel risers to operate both up and down when climbing? As easy as the flip system, e.g. on the verticals? Hey Conrad, operating the heel risers is about the same as operating the smaller(low) riser on the Radical's flip system! 1) do the bindings accommodate standard dynafit crampons? 2) I understand that, while the heel lateral release runs from 6-10, the heel vertical release is fixed. I've read that it is fixed at 8, which seems reasonable. Is that your understanding? (My bindings are typically set between 7 and 8). Thanks much for your great service. Hey Frederick! Glad they look good! Yes, they will accept standard Dynafit crampons. You are correct, lateral release is adjustable from 5-10 but the vertical release is fixed. There are a handful of factors, most notably boot sole length, that will affect your vertical release. We don't publicly display our release test data but if you are in the 7-8ish realm then you are likely a reasonable match with this binding. Feel free to send me an email if you'd like to discuss further, or even better, visit our binding finder. I assume these bindings don't come with leashes? Do you have a lightweight leash that you'd recommend? Thanks. Hey Deling, You are correct these bindings do not come with leashes. For a lightweight leash, check out the Dynafit guide leash or the G3 Ion LT leash. Do the SpeedFit toes use the same mounting pattern as the Speed Radicals? Hi Coby, yes the Speed and SpeedFit use the 30x39 Radical toe pattern. I have this binding on a Helio 105 with Maestrales. When touring the top of the maestrales will hit the toe lock lever and cause the binding to release. This is a very frustrating issue as every kick turn causes a release. Took them to the local shop and they said there was nothing they could do. I would recommend making sure your boot has a short enough toe welt to function properly before buying. FYI I am using the older 2016 blue buckle Maestrales. Hi Erik, we haven't seen this problem. What size boot do you have? Do you know the heel gap that is spec'd for this binding with boot locked down? Hi Chris, it is 5.5mm. It’s nearly impossible to spin the heel piece when used with a brake.. any solution to this ? Hi Chris, you can file down the little bumps it needs to surmount. Wondering if anyone knows about installation of brakes after these bindings have been mounted? The heel piece has to come off of the baseplate (it's sitting on a threaded baseplate) and the plastic nubbin piece that's in the way of installing the brakes pops off and the brakes take its place. Then you have to thread the heel housing and brake back onto the baseplate and you're all good to go! Just to clarify- do you back the heel piece all the way off by the adjustment screw and it’s removed that way ? Hi Chris, yes and you may need to gently pry up the plastic piece in front of the housing to allow it to slide off the track. Hello! Is the weight 310gr, as in the text, or 348gr, as in the specs? Hi Sigurd, thanks for pointing out the discrepancy. The Specs have our verified weight of 348g, a bit over the catalog weight.